Viewing topic "Starting patterns by stroking a key … ?" On the MOXF you can start a Pattern by pressing a key. This can be set at the Pattern/Play page. Unfortunately, this setting affects all patterns in the current pattern bank. Does anyone know if it’s possible to set this for individual patterns only, and if so, how? The Keyboard Start setting indeed acts globally. It can’t be set individually for different Patterns, and can’t even be stored - Keyboard Start will revert to the default setting of “off” if the MOXF is powered down and back on. Could you explain in some detail what you’re needing to do? Perhaps there’s a different approach that would satisfy your needs. I tried other approaches. But the pattern is too long for an user arp, and for songs there is no keyboard start function. Why do you need to start a particular Pattern by pressing a key, as opposed to pressing the sequencer Play button? Why is having Keyboard Start “on” for other Patterns not desirable? Are you using Pattern Parts for live play? 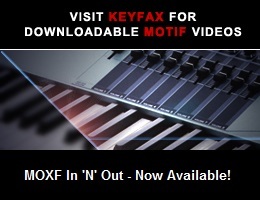 Are you using any MIDI gear external to the MOXF? Detailed application information might (or might not) lead to suggestions. Oh, I apologize :). I believed the problem was clear. No, I’m not using external MIDI gear. Yes, I’m using Patterns for live play. I want to start this specific pattern synchronized, while I’m playing piano with both hands, so I have no hand free for pressing the SEQ PLAY button. I want to start other patterns manually, and not, if I’m pressing any key. I understood from your initial post what you wanted. I was hoping that sufficient usage detail might lead to a solution. Leave Keyboard Start “off”, so that pressing keys won’t start the sequence for any of the Patterns. Then use a MIDI pedal to send a MIDI Start (FA hex) message for the Pattern requiring synchronization, which would be hands-free. It’s not as foolproof as using Keyboard Start, but it will work well as long as your timing is good. Great. It’s even easier. You don’t need a MIDI pedal that can send a FA (hex) command. Connect a simple foot switch to the assignable foot switch input, and set the FS controller value under [Utility/Control Assign] to 97 (Play/Stop). Now the pattern can be started and stopped with the foot switch.